VERMILION, AFTERWARDS (taking in with a sweep of her arm the splendid rococo-deco vastness of the Rainbow gallery): "Rock'n'roll belongs in the pits, not here". Which may go a little way toward explaining a small, yet buzzing/persistent sense of dislocation about tonight . . . might be familiar now for punk groups to tread the Rainbow's vastness but no contempt! Reputations shiver and die somewhere between the press pit and the outer circle . . . Notoriously hard on support groups. 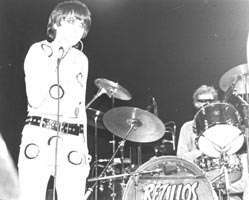 The Rezillos work hard: amuse, entertain with their odd mixture of menace and cartoon capers, make solid new-fashioned noises, but fail to elicit much reaction. Very flashy, very fast, with visual attention sometimes effectively, sometimes distractingly, spread (evenly) between Fay Fife (resplendent in soap-bubble orange/green PVC) and Eugene Reynolds (shrieks, whoops, and revivalist sensibility). Watch this space: for sure, they have a future . 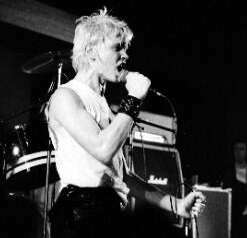 . .
Generation X surprise with authority gained, stature reached. Idol is now relaxed enough to be himself more: smiles replace pouts and confidence grows. Bob Andrews carries the lead/rhythm guitar parts with almost contemptuous dexterity: the whole group is tighter as a unit. And they use the stage, moving every which way. Tonight they mostly run to a vacuum, reaping rewards for their energy only during the last, more familiar numbers: 'Day By Day', 'Your Generation', 'Wild Youth'. Come the (deserved) encore the set catches fire, as . Andrews runs amok all over the stage in the only logical climax to the fire/ aggressiveness of his playing. To these eyes there are, however, still nitshit doubts. All the elements are there, but little things worry me: a tendency is creeping in to sing about rock'n'roll/still detectable is a certain hesitation about direction which leaves them playing safer than they can and (still) in danger of falling between several stools. And as a whole, the set was too monotone in pace (flat out), with subtlety (of which they're very capable) sacrificed for flash. Whatever, tonight they score a success by winning a cold crowd over: they seem poised at the next rung on the ladder . . .
Ramones. At the end - the audience is stunned. Blank. Shell-shocked. Slowly finding its wits to demand three encores. The only possible reaction. Expectations fulfilled., and more: awesome hasn't been a word that comes to mind in describing the Ramones but maybe I'd better get used to it...View from Row F. They're so loud! Set of 25/30 songs, run into one another - no break.  Piledriver into submission - gabba gabba we accept you. So devolved we are not whole. Joey is the centre of attention, broken anglepoise flanked by two Byrds cuts (shaggy) shaking violently. Bird with a broken wing, he really doesn't seem to like it here: he flaps, jacknifes, trying vainly to get out of his skin, break the physical bounds of his height. But never - the tension in watching his vain attempts is considerable. Band louder, heavier than last time (Roundhouse). Material familiar and, it must be admitted, interchangeable - fast-food conveyor-belt riffs/slogans. Two moments among the holocaust: brief intermission (30 seconds/lights off) as they change into the one slow number 'Here Today' - Joey's faithful reproduction of the ludicrous bathroom noises at the end of 'Surfin' Bird'. To me they still sum up America in breadth to the extent that they could be the perfect paradigm (in their frank ephermerality) of the rapid-turnover USA economic system weaned on Arms Supplies (WW II made the money), quickly moving in peace-time Fifties to fast-fad rock'n'roll - here today, gone tomorrow . . . In the end, they probably define punk more accurately, more completely than anyone else. 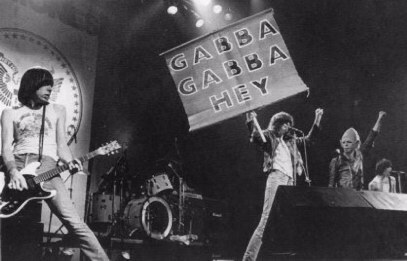 Other bands may be more charisma tic/rhetorical/passionate, but the Ramones are the beginning and (ultimately) the end. Which, to be sure, in itself is going to cause long-term problems . . .